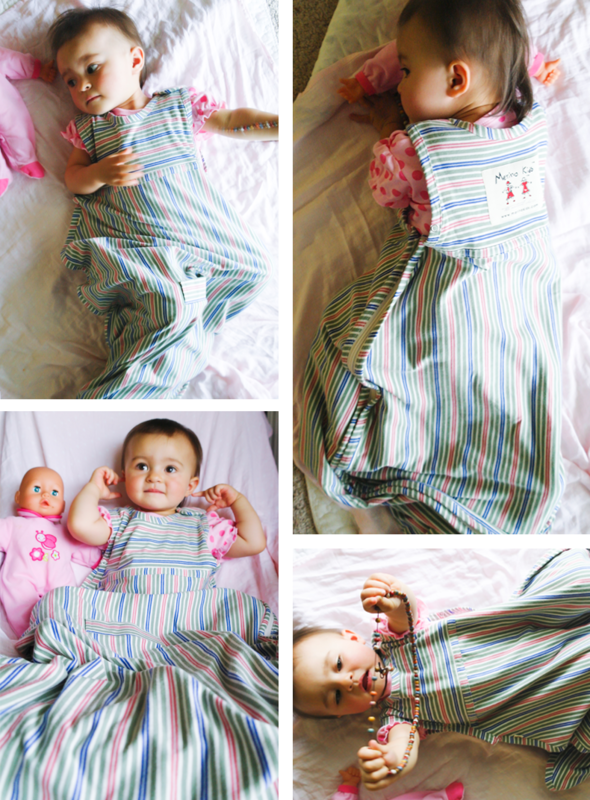 I was recently invited to test and review a gorgeous organic cotton sleeping bag from Merino Kids. If you haven't heart of Merino Kids just yet, they are an amazing company that produces organic cotton baby sleep bags and sleep wear. Their products are extremely well made, durable,beautifully stylish and made of top-quality materials that are good for your little ones. 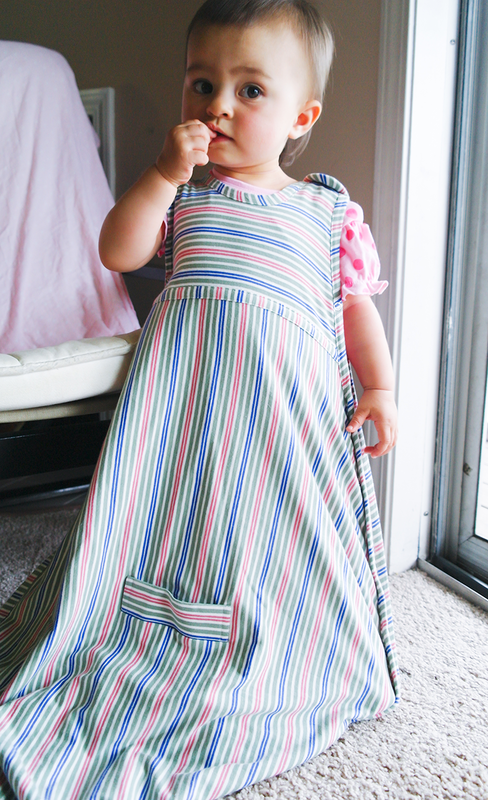 ♥ Features two layers of organic cotton, 100% natural and GOTS-certified. No pesticides or other chemicals used. ♥ Replaces blankets. Baby can't slip underneath or wriggle out and wake uncovered and cold. 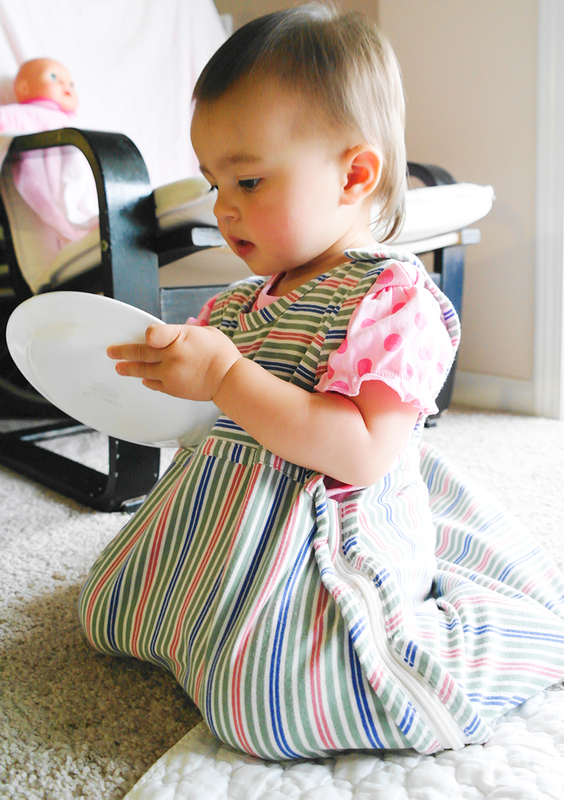 ♥ Fits growing child safely and comfortably for up to two years. Excellent value compared to other sleep sacks that last only a few months. ♥ Innovative safety belt aperture makes it easy to transfer sleeping child between car seat, stroller and nursery to maintain sleep routine. ♥ Ideal for use in warmer conditions. Can be worn over merino or cotton sleepwear to suit different room temperatures. 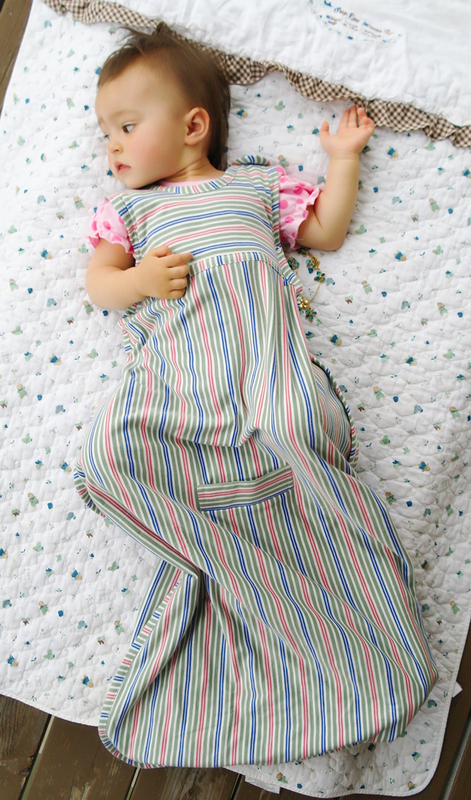 I received this fabulous organic cotton sleep-sack for toddlers 2-4 years. It's called MULBERRY. My 16 month old daughter is one of those kids who toss and turn a lot while sleeping. She always ends up throwing her blanket off and I usually find it curled up in the corner of her crib. On top of that, we live in the top-floor apartment and our poorly insulated apartment is either too cold or too hot, depending on the season. When my daughter is too cold she wakes up crying, but adding another layer of clothing rarely helps - she usually ends up overheating, sweating and yelling her head off in the middle of the night. It's been a huge struggle for me to try and find just the right balance, and the temperature fluctuations in Buffalo, NY do not help with that at all. We have tried swaddles, regular blankets, double-layered blankets and other sleeping sacks, but they either ended up tossed aside or - in case of the sleeping sacks - they weren't spacious enough for my daughter to move around comfortably. And she just hates having her movements restricted in any way. Seeing how extra long and spacious the Merino Kids organic cotton sleeping sack is, I thought it was worth giving a shot. And oh boy, I am so glad I did, because this sleeping sack is absolutely fantastic! It's made out of 100% organic cotton that is incredibly soft and pleasant to the touch. The cotton is double layered, which makes the sleeping sack seem pretty thick and warm, but since it's made out of material that breathes, your child won't get too hot or sweaty. On top of that, the sack is completely chemical and pesticide free - you need to be extremely careful around the fire, though, because it does not contain flame retardant (which, btw, is awesome, because it's a carcinogenic chemical used in most of baby wear and baby sleeping sacks). You can wash it in 40*C or lower, but you shouldn't tumble dry it or soak it. You can also iron it if needed, but you should use the lowest temperature setting. It is pretty obvious to me that this sleeping sack has been designed with the ultimate comfort of your child in mind. The top fits pretty nice and snuggly, while the bottom is super long and wide, leaving plenty of space for your child's legs. My daughter can even easily get up in this sack, but awesomely enough she can't climb out of her crib (another plus!). 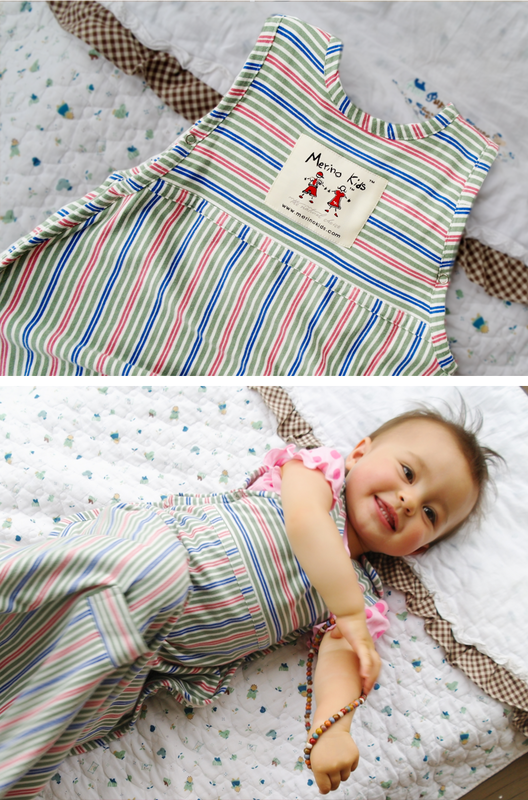 The zipper is concealed in a fold of fabric, so your kid can't unzip the sleeping sack on its own. It also comes with an innovative safety belt aperture that allows you to easily transfer your child from the car seat to the stroller. It's very convenient! At $89.99 it probably isn't the cheapest sleeping sack on the market (though I am sure there are more expensive ones out there, too), but, in my opinion, it is absolutely worth every penny. It's not only extremely well made, cleverly designed and beautiful looking, it's also made to last much longer than most of the sleeping sacks I've seen. So, while it may seem a bit on the pricey side, you need to keep in mind that with other sleeping sacks you will probably end up updating to larger sizes every few months, spending way more on the long run. Plus, children are habitual creatures, they don't like changes. Ones my daughter gets used to a blanket, it is almost impossible to get her to sleep under a different one. In that sense, Merino Kids sleeping sack is definitely a better choice. 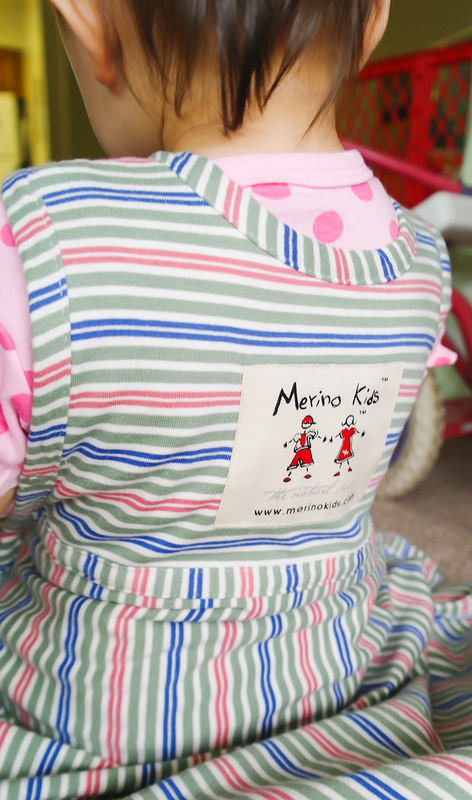 These are just a couple other products from Merino Kids that I absolutely love, to find more, please visit: MerinoKidsUSA.com!